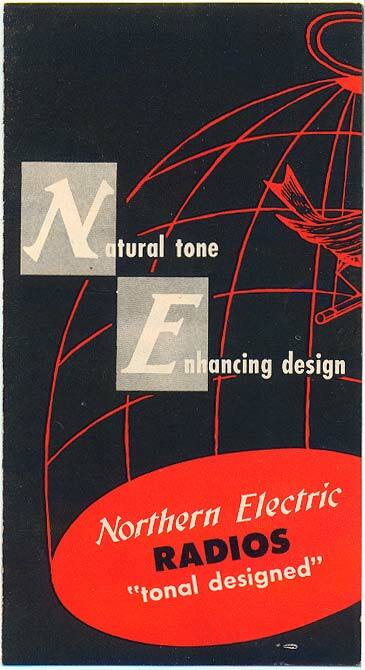 Northern Electric brochure: "New 1951 Models"
Dimensions (folded): width = 84 mm,, height = 156 mm. Clicking on the thumbnails will open a new browser window with a larger 72 d.p.i. scan, scaled up to 150% of the original size. The captions are taken from the brochure itself, except for additional notes by me in square [...] brackets. I did not attempt to clean up the images in Photoshop, hence the creases, stains, and pencil marks. If you look closely at the third page, you'll see the number "2995" written in pencil over the Panda set. I suspect that it means that the retail price was $29.95 (Cdn), which sounds about right for the period. 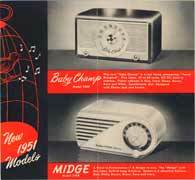 This promotes the same three models as shown in the full-page magazine advertisement that I have, also from 1951. This new "Baby Champ" is a real Home companion, "Tonal Designed", Five tubes, 25 or 60 cycle, AC/DC, built-in antenna, Plastic [bakelite] cabinets in Blue, Ivory, Green, Brown, Rose and White. Speedometer dial. Equipped with with Phono-Jack and [phono/radio] Switch. A Giant in Performance  A Midget in size. 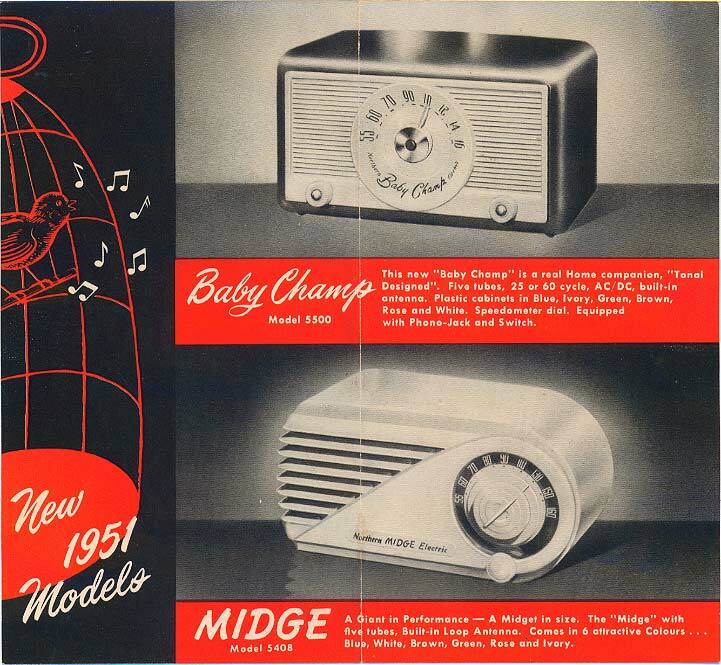 The "Midge" with five tubes, Built-in Loop Antenna. Comes in 6 attractive Colours . . . Blue, White, Brown, Green, Rose and Ivory. 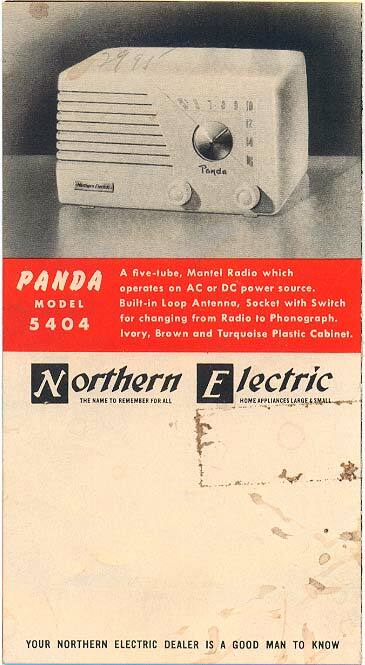 A five-tube, Mantel Radio which operates on AC or DC power source. Built-in Loop Antenna, [phono] Socket with Switch for changing from Radio to Phonograph. Ivory, Brown, and Turquoise Plastic [bakelite] Cabinet. Back to my Northern Electric models.